Austin Police Chief Brian Manley, center, stands with other members of law enforcement as he briefs the media, March 21, 2018, in the Austin suburb of Round Rock, Texas. Police from Austin, Texas, said Wednesday a suspect in a string of deadly package bombings is dead after detonating an explosive device inside his vehicle alongside a highway as officers approached. Austin Police Chief Brian Manley told reporters that authorities became confident of the identity of the 24-year-old white male late Tuesday and early Wednesday, and located his vehicle at a hotel just north of Austin before he drove away and later set off the explosive. Manley said the investigative team that included the Federal Bureau of Investigation and Bureau and Bureau of Alcohol, Tobacco, Firearms and Explosives believe the man is responsible for the five bombs that exploded in the Austin area dating back to March 2. Those blasts killed two people and wounded four others. "That's the one thing we don't have right now is a motive behind this," Manley said. "We do not understand what motivated him to do what he did." Manley added that authorities do not know if the suspect was on his way to deliver another bomb, and that they are not yet certain he acted alone in the attacks. One officer suffered minor injuries in the early Wednesday blast along the highway in Round Rock, and one officer fired his weapon at that scene. Members of law enforcement stage near the area where a suspect in a series of bombing attacks in Austin blew himself up as authorities closed in, March 21, 2018, in Round Rock, Texas. President Donald Trump praised authorities a short time later on Twitter. "AUSTIN BOMBING SUSPECT IS DEAD. Great job by law enforcement and all concerned!" he said. The latest attack happened early Tuesday morning when a package bomb blew up at a Federal Express shipping facility near San Antonio, about 100 kilometers southwest of Austin. One worker sustained minor injuries. 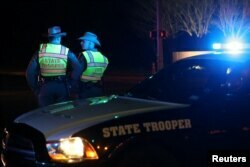 Texas state troopers keep watch at a checkpoint as nearby law enforcement personnel investigate an incident that they said involved an incendiary device in the 9800 block of Brodie Lane in Austin, Texas, March 20, 2018. Police also responded Tuesday to a FedEx facility outside the Austin airport to investigate a suspicious package and determined it both contained an explosive and was linked to the other explosive packages. Speaking at the White House on Tuesday, President Donald Trump called the person or persons behind the attacks "very sick." Investigators said another package bomb that exploded late Sunday in Austin, injuring two people, was set off by a tripwire and was more sophisticated than the three blasts that took place earlier in March. Police are investigating the bombings as possible hate crimes. The first three explosions killed two African-American men and left a 75-year-old Hispanic woman fighting for her life. Authorities offered a $100,000 reward for information leading to arrests and convictions of those responsible for the explosions. Firefighters stage near the area where a suspect in a series of bombing attacks in Austin blew himself up as authorities closed in, early March 21, 2018, in Round Rock, Texas. Police investigated another incident in Austin on Tuesday, but said an incendiary device was responsible for injuring a worker at a charity store and that it was not connected to the package bombings. Austin Assistant Police Chief Ely Reyes told reporters an employee at the Goodwill store was told to dispose of a box of items that included two small devices, one of which "initiated" when the employee handled it. Reyes described the item as "approximately 6 inches in length, almost like a 40mm-type artillery simulator device."